(From EPFL News)— Electrons spin around atoms, but also spin around themselves, and can cross over from one spin state to another. A property which can be exploited for next-generation hard drives. However, "spin cross-over" has been considered too slow to be efficient. Using ultrafast measurements, EPFL scientists have now shown for the first time that electrons can cross spins at least 100,000 times faster than previously thought. Aside for its enormous implications for fundamental physics, the finding can also propel the field of spintronics forward. Although difficult to describe in everyday terms, electron spin can be loosely compared to the rotation of a planet or a spinning top around its axis. Electrons can spin in different manners referred to as "spin states" and designated by the numbers 0, 1/2, 1, 3/2, 2 etc. During chemical reactions, electrons can cross from one spin state to another, e.g. from 0 to 1 or 1/2 to 3/2. Spin cross-over is already used in many technologies, e.g. optical light-emitting devices (OLED), energy conversion systems, and cancer phototherapy. Most prominently, spin cross-over is the basis of the fledgling field of spintronics. The problem is that spin cross-over has been thought to be too slow to be efficient enough in circuits. Chergui's lab focused on materials that show much promise in spintronics applications. In these materials, electrons jump through four spin-states: from 0 to 1 to 2. In 2009, Chergui's lab pushed the boundaries of time resolution to show that this 0-2 "jump" can happen within 150 femtoseconds - suggesting that it was a direct event. Despite this, the community still maintained that such spin cross-overs go through intermediate steps. But Chergui had his doubts. Working with his postdoc Gerald Auböck, they used the lab's world-recognized expertise in ultrafast spectroscopy to "crank up" the time resolution. Briefly, a laser shines on the material sample under investigation, causing its electrons to move. Another laser measures their spin changes over time in the ultraviolet light range. With profound implications for both technology and fundamental physics and chemistry, the study is an observation without an explanation. Chergui believes that the key is electrons shuttling back-and-forth between the iron atom at the center of the material's molecules and its surrounding elements. "When the laser light shines on the atom, it changes the electron's spin angle, affecting the entire spin dynamics in the molecule." 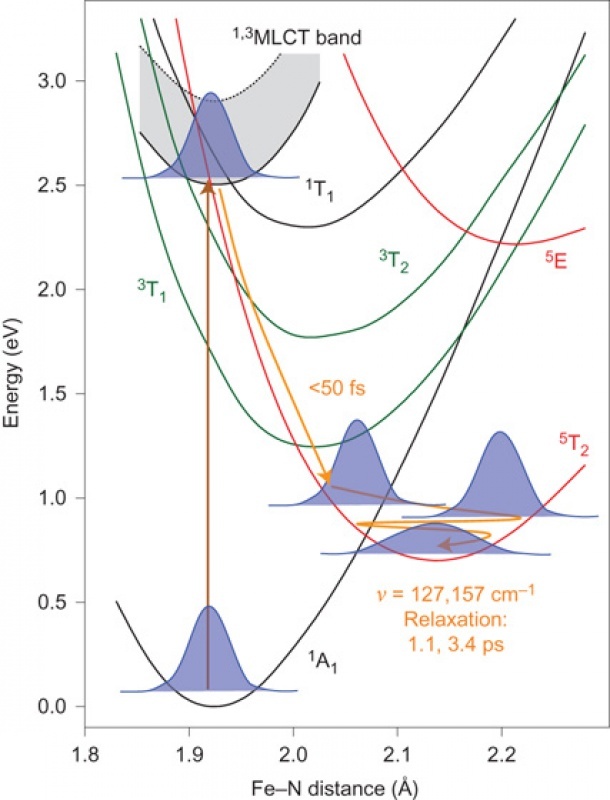 It is now up to theoreticians to develop a new model for ultrafast spin changes. On the experimental side of things, Chergui's lab is now focusing on actually observing electrons shuttling inside the molecules. This will require even more sophisticated approaches, such as core-level spectroscopy. Nonetheless, the study challenges ideas about spin cross-over, and might offer long-awaited solutions to the limitations of spintronics.